A simplified way to read the Bible that offers younger readers a plan tailored just for them. God has given us an immeasurable gift—his very words, recorded in the Bible for us to read. Structured reading plans provide a great way to read through the whole Bible, but they're usually not designed with kids in mind. 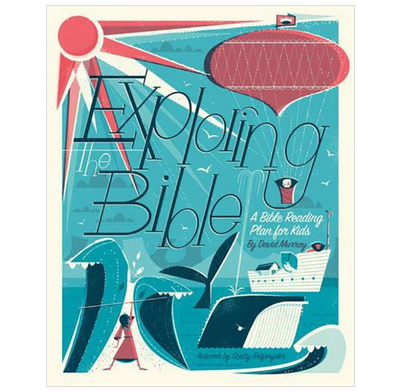 In Exploring the Bible: A Bible Reading Plan for Kids, David Murray presents a simplified way to read the Bible by offering younger readers a plan tailored just for them. His 365-day plan guides children through key passages from Genesis to Revelation, helping them see and appreciate the big-picture storyline of the Bible. Each passage is also followed by a question to answer or a verse to write out, as well as space to write out a prayer— encouraging interaction with the text. This book will instill in children the habit of being in direct contact with God's Word each day, equipping the next generation by laying the groundwork for a lifetime of Bible reading. Thankyou - our grandsons are loving the book ! Bought the book for the Sunday School children and they loved it, as it provides them with activities to do daily at home too.